If you’re into planting, this DIY hand-held corn and bean planter is for you. Planting is fun. It can be a great pastime and an effective way to take your mind off things. Plus, it’s satisfying, too, especially when you get to harvest the fruits of your labour. But do you know what takes the fun out of planting? Back pain. If you’ve been planting beans and corn, you know what I mean. The task involves a lot of stooping, bending, and crawling. You have to poke the ground with your finger to create a hole where you’d drop the seed. When everything’s done, you end up with a sore back. You love doing it, but why deal with a sore back when you can prevent it in the first place? No more bending, stooping, and crawling! Here’s a great idea: a hand-held bean and corn planter! Say goodbye to stooping, bending, and crawling. 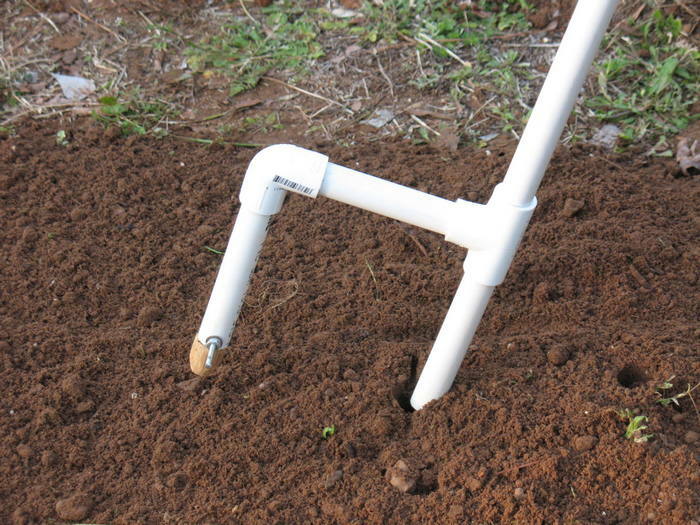 You can poke a hole, drop a seed, and plant while standing upright. Neat stuff, right? This project is very easy to make. You can finish making this in under an hour – and it’s inexpensive, too! The materials are also easily found at your local plumbing or hardware store. Gather everything you need and let’s get to work! For a closer look at the finished product, check out the gallery below.